Trauma is a creeping menace, taking root in the body and passed down through family lines. It’s a hard thing to describe without the aid of clinical studies, and an even harder one to visualize on screen. 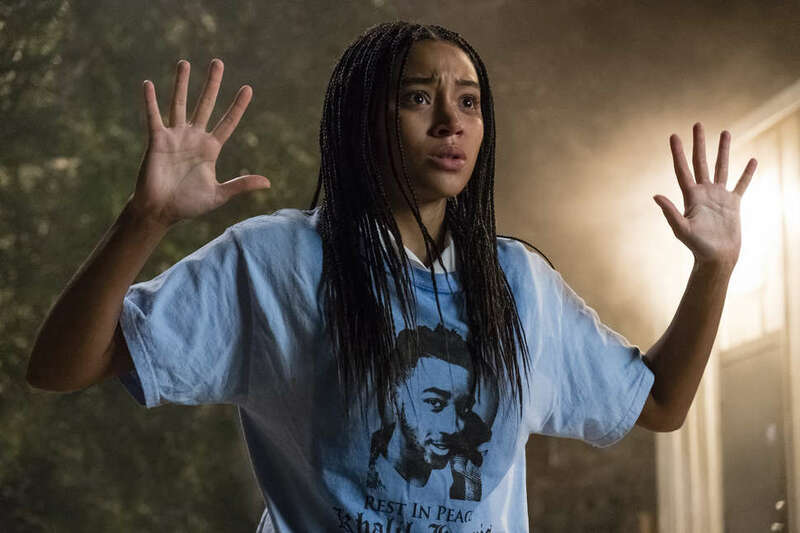 But in the film The Hate U Give, based on the young adult novel of the same name, trauma is almost its own character, a force that envelops each of the people we get to know. There’s Starr, played by Amandla Stenberg, who while trying to balance her life in her underserved, African-American neighborhood with her other life in lily white, private Williamson High School miles away, must contend with the trauma of seeing her childhood best friend murdered. The film revolves around her witnessing her second murder -- that of her other childhood friend Khalil who is killed by a police officer during a traffic stop -- and her attempts to come to terms with that trauma and use her voice to speak out against the injustice. But there's also her parents, Maverick and Lisa, played by Regina Hall and Russell Hornsby, who wrestle with how to shield their children from the violence and loss they themselves had to endure throughout their lives. There are Starr’s two brothers, Seven and Sekani, who must witness their father being victimized by police. And then there’s the black community that surrounds them in the fictional town of Garden Heights, living with the trauma that the local police force, as well as the neighborhood’s ruling gang, the King Lords, subjects them to on a daily basis. It’s no easy task to convey the terror, shaking anger, and haunting memory of longstanding trauma. But in her impressive performance, Stenberg nails it, evoking that hurt even when Starr is forced to swallow it down in front of her classmates and white boyfriend Chris, played by K.J. Apa (Archie on Riverdale). From the moment she witnesses her friend murdered by a police officer to the moment she screams "Khalil lived" into a megaphone from the top of a cop car to a crowd of gathered protesters demonstrating against the inevitable grand jury decision not to press charges against the officer responsible, it’s impossible not to feel that ungraspable pain resounding from the screen. The film version of The Hate U Give has a lot to live up to. Aside from having to do justice to the very real stories of the communities and loved ones left behind when police brutality claims yet another black life, it also had to live up to the legacy of the book it is based on, written by Angie Thomas and published in 2017. The title inspired by the philosophy behind Tupac Shakur's THUG LIFE iconic stomach tattoo, The Hate U Give is a powerful YA novel that instantly drew praise from readers and critics alike, debuting as a New York Times best-seller and earning a slew of honors and awards. And while the film simplifies the story somewhat (as all film adaptations of books must), it never loses its heart, the brilliant emerging of Starr into her own voice and pride in the community that lifts her up. Undoubtedly, Stenberg is the powerhouse of the film. But the chemistry between Stenberg and her movie dad Hornsby is equally crucial to the film’s emotional power. Both actors have the ability to speak loudly even in their quietest moments. Much of their performances involve bearing witness -- to police brutality, to the abuse of loved ones, to each other slipping in and out of their painful memories. It’s that expressive physicality that truly makes the script buyable, that makes lines like Maverick telling Starr, "Nightmares are worst right after," just after she wakes up from a PTSD nightmare, as heartbreaking as they should be. If there’s anywhere the film doesn’t succeed it’s in its almost too-neat ending. Starr and her brother Seven become trapped in their father’s Garden Heights grocery store after King Lord’s boss King and his goons set it on fire in retaliation of Starr speaking out against the gang on national television. The entire Carter family shows up to save them and Maverick, understandably enraged, moves to fight King. However, Maverick discovers his gun is gone, having unknowingly been snatched by his youngest son Sekani, who then points the gun at King just in time for two police officers to show up and draw their own guns on the elementary schooler. Cue the dramatic standoff in which it seems that the Carters will suffer another tragedy, losing their son to yet another police shooting in Garden Heights. At this moment, Starr, hands up, puts herself between her little brother and the police, tearfully urging them to end this cycle of violence. This dramatic speech is enough to get the officers to slowly lower their guns and Sekani to place his on the ground. It’s a nice movie moment, but one that requires a little too much suspension of disbelief for a movie that otherwise leans on social realism. The following scene wraps up all the loose ends: King goes to jail for arson, thanks to the community’s collective "snitching" on him. Starr finally learns to be comfortable at Williamson, embracing where she comes from and leaving behind her reliance on code switching, as well as her friendship with an unsupportive, All Lives Matter-y white classmate. As for Garden Heights, we last see it bathed in sunlight, neighbors cheerfully going to and fro, rebuilding in the riot’s aftermath. In the book, the Carter family moves away from Garden Heights, but continues to rebuild and operate the grocery store in their old neighborhood. In the film, the family refuses to move, choosing instead to rebuild their business while staying in their original home. Both outcomes are believable choices for any real family to have made, but in the film, the trauma that simmers throughout its first hour and 40 minutes is suddenly gone, replaced with the kind of uncomplicated optimism that only characters in a Hollywood movie ever get to enjoy. It’s not that this film can’t have a happy ending, but rather that one without any hint of remaining conflict feels incompatible with the nuanced perspective that had driven the story until that moment. I wonder if I wouldn’t have found the end so underwhelming if the film’s subject matter weren’t so real, so critical, and so very far from such a real life happy ending. Overall, the film is worth seeing if only for Stenberg’s outstanding performance. And even if its end stands out as a flop, the rest of the film is a striking story of a young black woman, between two worlds, finding her most authentic voice.